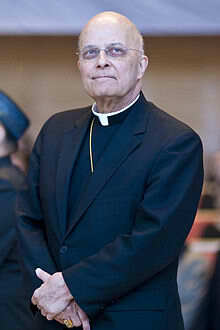 Catholic LGBT advocates in Chicago are split over an invitation extended to Cardinal Francis George for the Archdiocesan Gay and Lesbian Outreach’s (AGLO) 25th anniversary liturgy scheduled in June. Critics charge that the cardinal’s stance on LGBT issues should not warrant an invitation, while others hope the June liturgy will help to advance dialogue with the hierarchy. “‘The Rainbow Sash Movement opposes the cardinal’s visit because over the years he has personally opposed every bit of LGBT legislation that seeks to promote the human dignity of this community. He has told lies about our love for one another and has used the pulpit in his cathedral to mount a war against gay marriage and gay adoption; in other words, he has promoted bigotry against us. As if that is not bad enough he has been silent in the face of bigotry directed against us that promotes violence,’ wrote Murray. Appreciation for all that AGLO has provided the LGBT community since its inception in 1983 was expressed by many members, but personal concerns about Cardinal George’s record remain. One member was hopeful that the cardinal would spend time with the community after Mass, and plans to use such time challenging George about his opposition to civil marriage equality in Illinois. The liturgy is scheduled for June 16 at Our Lady of Mt. Carmel in Chicago’s Boystown neighborhood, where AGLO celebrates Mass weekly at 7:00 pm. The weekend celebration will also include an evening at the Lyric Opera and dinner to celebrate 25 years in ministry. Bondings 2.0 will be update on the AGLO controversy if any developments arise as June approaches. Francis George is, like it or not, a Bishop of Jesus Christ and a prince of the church, he should not need an invitation to attend any mass let alone one in his diocese.